Erected by his sons in memory of. 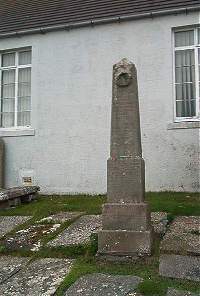 Donald Gunn, carpenter of Lybster, died 4th March 1875 aged 75. 1st wife Sinclair Sinclair died 12th November 1830 aged 29. Son Donald Gunn died in infancy. 2nd wife Helen Sutherland died 20th May 1879 aged 75. The Lord redeems his servants souls none perish that him trust. Ann Bain died September 1861 aged 36 wife of George Gunn, boatbuilder and joiner of Lybster. Him that believeth in me shall never die but is passed from death unto life.